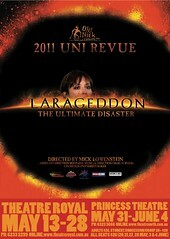 Now is the time to make a potentially life altering decision – would you like to be in the Uni Revue? The Old Nick Company puts on an annual Uni Revue, an all-original variety comedy show that plays in front of thousands of Tasmanians every year. Come on down to Old Nick HQ – 50a Letitia Street, North Hobart – we’ll open the doors at 12PM on Sunday the 26th. The barbecue will be fired up, and we’ll have snags and vegetarian foods and soft drink and water, all the good stuff. Come along, have a chat, meet the production team and the other people auditioning and calm your nerves. You’ll fill out an audition sheet (name, number, allergies, etc) and book a time for your individual audition. In the audition you will need to dance, sing and tell a joke. What is important to know is that you shouldn’t be stressed if you’re a good joke teller and not much of a singer or dancer, or if you’re a great dancer and not much of a joke teller or singer. The directors will make every effort to utilise people to the best of their talents and abilities, and not everyone needs to be a so-called “triple threat” to have a chance at Uni Revue. At 1PM the auditions start. To start off with we will play a few theatre sports games to get you comfortable with what’s happening and have a bit of fun. We’ll have a chance to see how you go in a group environment, so no pressure! After that we’ll all have a sing in a group with our handsome MD (that’s Musical Director) Tom Howard. This will be followed by teaching you a bit of a dance and see how you move and whether you stand out in a crowd in a good way. After we’ve finished all the group activities we will go into the individual auditions. You will organise a time with one of our lovely organised production managers before the group auditions begin. These will go for around five minutes. Tell us a joke – what the joke is and how you present it is up to you (feel free to steal one off the internet or your mates). Sing a solo song with our MD. Tom will have a song prepared, or you can sing a song of your choice (this will have to be a cappella). Once this is all complete we will contact you via either phone or email to inform you whether or not you were successful. Okay, so I’ve gotten into the show. What now? The commitments to Uni Revue are much like many other shows. We rehearse every Wed and Thursday night from 7PM until 10PM, and Sundays from 10AM until 4PM (and later that may be as long as 9-5 when we’re close to opening!) We will do our best to schedule it so if you have nothing to do you know not to come in, or to arrive later or leave earlier. We also often include a slew of videos in the show, and these are produced outside of rehearsal hours so if you want to participate it may mean scheduling in a Saturday afternoon or an evening sometime. Rehearsals go all the way up to May 12th, when we open at the Theatre Royal. Our season lasts until the 27th of May in Hobart. Calls to the theatre are to arrive around 6PM to prepare and have a microphone fitted, and then 8PM the show starts. From May 31st – June 3rd, we are at the Princess Theatre in Launceston. In Launceston things are a little more relaxed. We provide accommodation and breakfasts. Unless you have to study your days can be spent lazing away and soaking up the northern atmosphere. On Wednesday 31st May you will either bus up with the cast or you may drive up yourself, but you will need to arrive by early afternoon so we can do a tech run of the show before opening that same night. That is a big day, so be prepared for it. If you need to sit exams, they can be arranged at the Launceston Uni campus so you don’t need to stress about being away from Hobart. Many Uni Revue cast and crew members have sat exams in Launceston, so we can assure you the Uni is accommodating and it is easy to organise. So why should I do Revue? Now you may be wondering WHY EVEN AUDITION? Well, don’t take my word for it (who even copy-and-pastes this copy for the website anyway?) have a watch of these short videos and check out our YouTube channel and see if Revue is for you! If you have any other questions please feel free to contact us on our Uni Revue Facebook page. We are here to answer any questions you may have. 9 to 5 The Musical is about to try and make a living on stage!